Celtic Knot is unusual and engrossing historical fiction that winds plausible mystery elements into an ode to a treasured national hero. 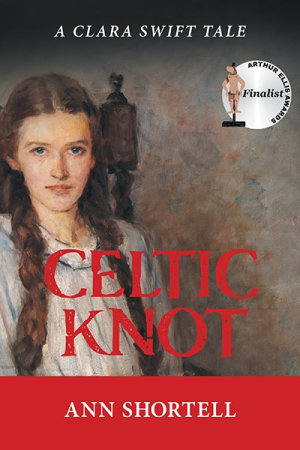 Ann Shortell’s Celtic Knot examines history through a young Irish teen as she grapples with a mystery, assassination, and political intrigue. In the early morning hours of April 7, 1868, an Irish rebel assassinated prolific author and politician D’Arcy McGee, a father of the Canadian Confederation. His staff heard the shot and rushed out to discover his body, with one housemaid witnessing a departing buggy. In this novelization, McGee’s trusted housemaid and scribe, Clara Swift, who thinks the world of her slain employer, sets down a path to discover an explanation for his murder. As Clara becomes swept up in the investigation, the trial, and the eventual hanging of an Irish immigrant, she records it all in her diary. Though the book’s major plot points are based in fact, its lead, Clara, is imagined. Her actions offer a unique view of the somewhat debated conspiracy behind McGee’s murder. The decision to frame the story through a fifteen-year-old housemaid adds a dramatic touch while retaining the unusual nature of the crime and its aftermath. Clara is a fascinating character. The entire story comes through her personal writings. While she is intelligent and determined, she’s still young and inexperienced. She idolizes McGee and frequently recalls his words and her experiences with him. She leads his story through all its highs and lows with her own flair and determination. McGee’s death doesn’t stop him from being a major character throughout the book. As Clara remembers him, his actions and thoughts resonate and drive her forward. Even readers unfamiliar with the historical events will connect with McGee’s gifts and understand why he was able to unite Canada. Polished prose captures the tones and styles of the late 1800s perfectly. Characters speak with appropriate accents and vocabulary. Often speeches in foreign languages go untranslated, with either paraphrased sections following or contextual clues to offer clarity. Since the narrative is entirely Clara’s, the ambiguity creates compelling interest even in less dramatic moments. While the assassination remains firmly in the spotlight, a secondary mystery simmers beneath the surface. McGee’s latest manuscript is missing and all signs point to theft. A connection between the theft and the assassination remains murky throughout. Clara’s loyalty to McGee drives her to discover the fate of the manuscript, one with important political ramifications.